In October of 1997, I was lucky enough to join friends on an exploratory trip into the remote San Borja Mountains. With a party of seven, including three Mexican cowboy guides, we rode on mules and horses into the mountains. 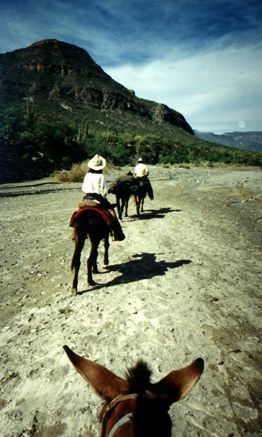 The trails we followed often dated from the time of the Spanish missions, and hooves of countless animals traveling these paths in centuries past had worn grooves deep into the rock. Our trip goal was locating previously unrecorded Indian pictograph panels.We did find numerous new sites, but most were badly eroded, and therefore not spectacular to see or to photograph. For me, the rock art soon became secondary to the beauty and isolation of the San Borjas, and the camaraderie of our group. 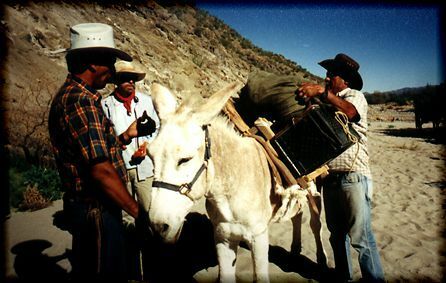 Loading the burros with provisions for the fourteen day trek. Leslie and Thomas admiring one of the better pictographs panels. 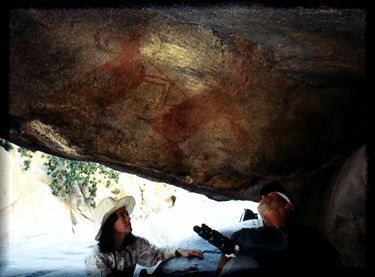 These paintings were well-preserved, perhaps because they were sheltered under an overhang. 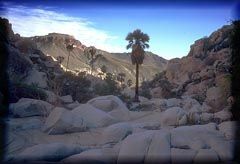 White granite boulders line San Matias Canyon. Native blue palms grow near the water sources. 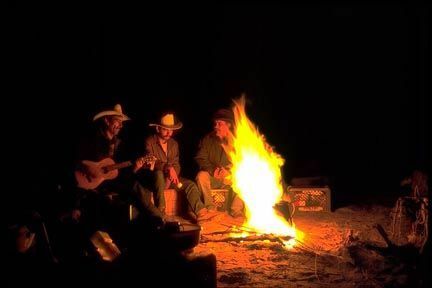 A cowboy serenade by firelight. ©1998 Mary Allen. All Rights Reserved. 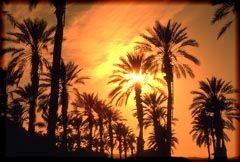 All photos copyrighted.